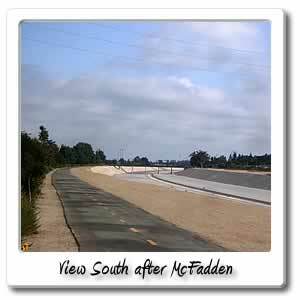 Welcome to McFadden Avenue on the Santa Ana River bicycle trail. 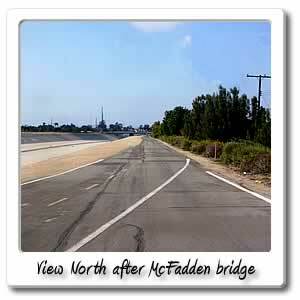 You can find the McFadden Avenue entry point and bridge 7.9 miles and 40 minutes from the beach. Going North after going under the bridge, you find the 8 mile marker for the Santa Ana River Trail. By going East after getting off the Mc Fadden Avenue exit, you will find a 7-11, pizza place, supermarket, chinese restuarant, donut shop and other shops in the shopping center there. This area is .4 miles and just 2 minutes off of the Santa Ana River Trail. You can get to the Pacific Electric Bicycle Trail, that goes slightly North to downtown Santa Ana, and South and Southwest to MacArthur Boulevard. 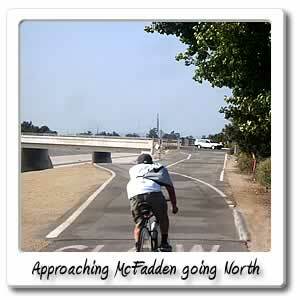 It is 2.9 miles and 16 minutes, East off of the Mc Fadden entry point on the Santa Ana River Trail. By going West after exiting at Mc Fadden Avenue, in the City of Santa Ana, will take you to the new Mc Fadden Triangle Habitat Restoration Park, which is at **** South Susan Street. 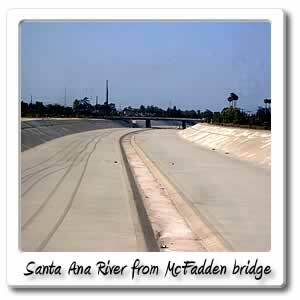 The first outter section can be accessed 476 feet and barely a minute off of the Santa Ana River Trail. Continueing West on Mc Fadden Avenue, shortly after the park and about 2 minuites and .3 miles off of the riverbed, on the other side of the street, you'll find a Wal Mart Super Center, a little farther West in the same shopping center you can find a Starbucks, Papa John's Pizza, Baskin Robbins Ice Cream, Ross Dress for Less store, and other shops by the time you, get to the corner of Mc Fadden Avenue and Harbor Boulevard, in the City of Santa Ana. By this time you'll be .5 miles and about 3 minutes off of the Santa Ana River Trail. Across the street, from the Wal Mart, is a Hawaiian food restuarant and shoe store. Across from that is a Mc Donald's and other shops. On the other side of the street is a super market, KCF and other shops. The next entry points South on the Santa Ana River Trail, is Edinger Avenue and Centennial Park next to it about .7 miles and 3 minutes away. The next entry point North on the Santa Ana River Trail is the newly widened First Street going through the City of Santa Ana, which is .7 miles and 4 minutes away. If you need to take the bus in the area, going North and South is the Harbor Boulevard one, which is one of the most frequently running. During peak hours it runs about every 15 minutes and about every 20 minutes during the weekend. Later during the evening and later hours, the bus will operate every 30 or 60 minutes.